True LIe-BOR: The Journey Of A Benchmark | Business Article | MBA Skool-Study.Learn.Share. In the international business scope, while the Euro zone crisis is getting everyone’s eyeballs, there is another story of a similar magnitude that has been brewing inside UK, the country which is most affected by it. According to some estimates the financial contracts based on this rigged benchmark rate are of the order of $800 trillion. 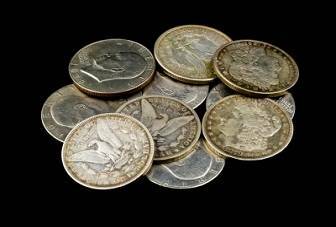 The benchmark rate we are talking about is the LIBOR, which has for many years been the trusted benchmark for financial contracts around the world and the recent doubts on its authenticity have made many in the business world uneasy. The fact that it affects so many and so much of what goes on, begs the world to take a closer look at this benchmark rate and see what goes into its making. LIBOR stands for ‘London Inter-Bank Offered Rate’ which is a benchmark rate licensed by British Bankers Association (BBA). It is calculated & published daily by Thomson Reuters. For this, Reuters takes quotes daily from major banks for the rate at which they could borrow unsecured inter-bank funds just prior to 11:00am London time. Once Reuters receives each submission it calculates the LIBOR for that day by computing the central tendency (using the inter-quartile mean). Inter-quartile mean is calculated by ranking the submissions in descending order and then excluding the highest and lowest 25% of submissions and taking the average of the remaining values. This is done for 15 maturities (overnight to 12 months) and ten currencies - 150 rates per day. The size and set of contributing banks which make up the panel varies by currency. The membership of each panel is reviewed annually by the Foreign Exchange and Money Markets Committee. Historically, the banks in the LIBOR market have been among the strongest in the world and include names like J.P. Morgan, Citibank, and Bank of America. The calculation that goes on at these banks for calculating their submissions is not declared in the open and is internal to the respective banks, thus different banks may be using different methods for calculating their quotes. Ideally, submitted quotes must truly depict the short term borrowing cost for a bank. We shall see later, the extent to which these quotes were subject to manipulations and helped fuel the increasing trust deficit for the banking world, which now sits on a burning volcano. Being the most important benchmark for short term rates globally, LIBOR is written into standard derivative instruments like interest rate swaps, forward rate agreements & foreign currency options, and loan documentations. World’s major futures and options exchanges use LIBOR as the basis for the settlement of interest rates contracts. Therefore, rises and falls in the benchmark can have serious consequences for commercial and consumer loans, including mortgages, worldwide. Economists and Financial Institutions use it as a barometer to measure the strain in economy. E.g. the LIBOR OIS spread is used to measure the credit risk in the system. OIS (overnight index swaps) are interest rate swaps at which depository institutions trade based on a specific currency. Because OIS is based on actively traded balances held at the central bank, there is almost no credit risk involved. And thus the LIBOR OIS spread is a measure of the default risk when lending to other banks. The following graph* shows the LIBOR OIS spread for the subprime crisis years. The fact that LIBOR-OIS spread is a barometer for the credit insolvency in the system can be seen from the graph as shown below. 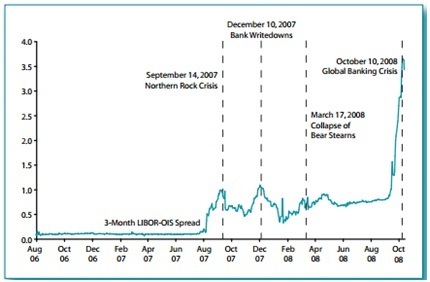 The spread suddenly spiked when certain events took place and reached highs during 2008 (banking crisis at its zenith). But the recent events questioning the veracity of the LIBOR have raised some doubts on whether this is truly a good indicator. Doubts about LIBOR being rigged were first raised by the Wall Street Journal as far back as in 2008 with ramifications being that the banks’ health could be in worse shape than they were willing to admit. The basis of the doubts on the trueness of LIBOR was the divergence of the 3 month interbank loan rate from the 3 month LIBOR, meaning that banks were at times borrowing at higher rates than the LIBOR. It must be noted that the quotes given by these banks are public to the world and thus, banks have an incentive to under-report their submission - not showing their true borrowing costs and how short they were on cash. At least one 300 year old bank, the second largest in the UK has been found guilty of rigging its LIBOR submission. Let’s take a closer look. The suspicions of FSA (Financial Services Authority) on Barclays rigging the benchmark rate were confirmed by going through the e-mails of traders which revealed the every-day manner in which they manipulated the LIBOR quotes to gain advantage on certain trading positions. After being found guilty, the bank has been fined £60m by the FSA. But even this figure pales in front of the fine of £290m by CTFC (the US Commodity Futures Trading Commission) and DoJ (the US Department of Justice), which amount to almost 10% of the profits from previous year. This has lead to the resignation of the disgruntled CEO Bob Diamond, triggering headlines like ‘Diamond not forever’ across the print media world. In more recent news, Barclays was being apologetic after booking a greater than expected profit of about its £4bn. According to the FSA investigation, the price rigging which dates back to 2005, in case of Barclays, fixing the LIBOR was done to increase profits (or reduce losses) involving groups of derivatives traders and several unnamed banks. Barclays was one of the leading traders in these derivatives and upon the investigation of FSA (in Britain) admitted that it would lose/gain up to £20m on any day based on these trades. Another grudge against this old bank is that even though it tried to portray that only a few brazen traders were involved in this manipulation, it seems that such behavior was widely tolerated on the different trading floors of the bank. 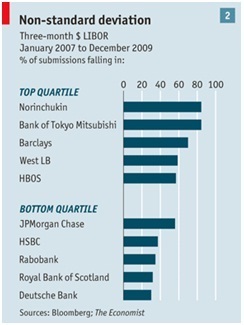 A snapshot of the trend of the quotes submitted by various banks over 2008 period shows that Barclays was one of the highest submitter of quotes which would get filtered out in the top quartile and thus would not actually contribute to the calculated LIBOR. If the submissions of Barclays were not amongst those actually used for taking out the average, then how did it affect the overall LIBOR rates? Let’s take the case of a bank’s submissions which according to the above figure were consistently among the bottom quartile and see how it affects the published LIBOR. Suppose there were two quotes – true quote and rigged quote that bank A could submit, true being higher (say 5%) than rigged (say 4.8%). Also assume that quote submitted by another bank B is 4.9% and that these quotes are at the border of the threshold of the lowest quartile. In the first case let’s assume that bank A submits the true quote of 5% such that it is the last (lowest) entry to be considered for calculating LIBOR. This means that bank B’s entry gets filtered and isn’t eventually used for calculating the LIBOR. In the second case suppose that the bank A was to submit the rigged quote of 4.8% instead of the true quote, making the submission by bank B of 4.9% eligible to be part of those submissions which are used for the calculation of LIBOR. This would filter out Bank A’s false quote of 4.8%. We can see from the second case, that even though bank A’s quote doesn’t get included in calculating LIBOR, it still affects LIBOR by creating a difference of 0.1% (difference between 4.9% and 4.8%) divided by the number of submissions being considered, in the LIBOR published. This was achieved by banks like Barclays when they lowered their rates even though they were part of the filtered quartiles. Seeing the high submissions published as given in the figure above, when questions were raised about Barclays’ health, it said that it was being honest whereas other banks which were obviously in poorer health than Barclays were under-reporting their costs of borrowing. Certain banks were actually borrowing at rates which were 30bps higher than their submissions for LIBOR. Later upon investigation by the regulators, Barclays admitted to reporting lower than actual rates at the time. They did so strategically so that the rates submitted by Barclays were high enough to get filtered out and yet not high enough to be the highest out of all the quotes, thus making the spotlight on its financial health a bit less harsh. As much as admission of one bank to its illegal demeanors brings a feeling of safety and justice to the average Joe, Barclays’ acts might just be the tip of the iceberg as up to 12 other banks have come under the scanner for rigging the rates. There has also been talk in the market about central banks abetting and aiding the banks in reporting lower rates. Whether BoE (Bank of England) asked banks to change rates or not, the regulators had a pretty clear motive for wanting a lower LIBOR during the subprime crisis: since British Banks were being shut out of the markets and the two hardest hit banks, Royal Bank of Scotland and Halifax Bank of Scotland, were both far too big to fail, and so lowering LIBOR would help these banks support themselves in a better way, rather than depending on the regulators to do so. Thus, in times of systemic crises, the central banks faced a conflict between maintaining financial stability and allowing the banks to operate transparently. No one knows exactly how many banks were explicitly or implicitly involved in this rigging but some estimates say that the difference between actual LIBOR and rigged one could be at 30bps. If we were to do the math for that and consider the $800 trillion of trades annually, we would get a value of 14.4 trillion for which those relying on this number have been fooled since past 6 years. To be fair, assuming half of the people benefitted and half lost, we divide this into half, giving a whopping 7.2 trillion loss to the world! This is many times the combined capital of all of the too-big-too-fail banks in the United States and close to the GDP of China! We now know that the regulators had an important role to play in the crisis. The companies involved were given leeway in terms of having allowance to operate without proper guidelines and supervision. The extent of the banks' future liabilities shall depend on whether these regulators help them by compensating for damages or punish them for their misdeeds. In the latter case, the companies may even go to the extent of filing for bankruptcy, and in effect request for bailouts. This will bring into play the slow legal process which will take years to play out. Hence, the only logical solution seems to be a Central Bank or Government backed deal for sharing the damages caused by LIBOR fixing. This means that all the claims against Banks shall be met by both the Banks and the Central Bank or Government. Credible reporting procedure: Ensure that banks, while submitting quotes, mention the reasons for doing so. It is of utmost importance to establish best practices for calculating LIBOR and even more important to reason such calculation to prevent deliberate misreporting. Increase global participation: LIBOR should represent the global demand for unsecured interbank funding, and be less susceptible to issues related to any particular region’s banking problems. The size of the panels, hence, must be increased in terms of increased geographical involvement. Regulate Central Banks: Ensure transparency in operations of the Central Bank. The last duty of the Central Bank is to tell public the truth. The least they can do is to adhere to the standards set by them. Prohibit LIBOR trading: Put a ban on Bank’s proprietary trading involving derivative instruments that are directly or indirectly related to LIBOR. Improve public confidence: Ensure public/corporate safety in assuming the underlying benchmark, and promise them compensations for whatever wrong doings that have undone their possible profits or enhanced the losses they have made. This article has been authored by Anupriya Asthana & Siddharth Janghu from Management Development Institute, Gurgaon.